The ASV publishes a Quarterly Bulletin that includes professional and avocational papers relevant to research in Virginia. Topics range from Paleoindian research to the archeology of the twentieth century. The ASV Press is responsible for editing, printing, and distributing the Quarterly Bulletin. Our circulation has private, public library, institutional, and governmental agency subscribers. 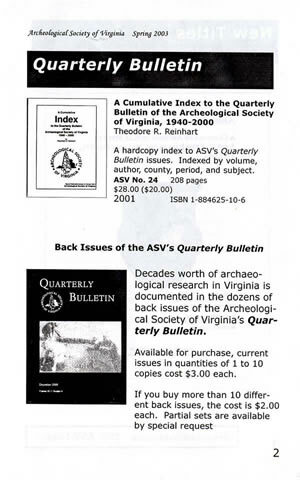 A large number of Quarterly Bulletin back issues are now available from the Archeological Society of Virginia. The copies date back to the 1970s. These publications contain a plethora of data pertaining to Virginia's past, and articles are often quoted in state, regional, and national journals. There is also an Index to the Quarterly Bulletins. If you are not an ASV member, join for $25. Membership includes a subscription to the Quarterly Bulletin, and new members receive the current issue when they join.